Your home is more than just a place to rest your head at night. It is the very center of your life and where the majority of important decisions and memories will be made, making it vital that you find somewhere to live that you love. When you think about your ideal future, many different things will appear for different people. Some will want to raise a large family, others will dream of a glittering career, and some maybe want a modest life to share with their friends and pets. Whatever differing aspirations people may hold for their personal futures, one element will be present in all of them - owning your dream home. Your home is more than just a place to rest your head at night. It is the very center of your life and where the majority of important decisions and memories will be made, making it vital that you find somewhere to live that you love. Of course, happening upon such a place is quite a gamble and one option to ensure you are achieving your dreams is to build your own, custom home. This may appear to be a huge task and, while it may take a little while for this plan to get off of the ground, it is far from impossible. To help you out, this handy guide is going to take you through some of the essential things you should know about building your forever home so that you can finally start planning for the future you want. When you embark on the ambitious task of building your own custom home, money will most likely become your primary concern. With this as a starting point, there are three phases you need to go through to ensure you have enough to complete the task to the standard you want. The last thing you want to do is spend any money before you have a clear and strict budget set out to stick to. Luckily, you can find lots of help online about the costing up building a home. One of the key things you need to remember when costing up is always to include extra money so that if something goes over budget unexpectedly, you’re not caught short. Alongside this, always budget for the most expensive version of every item and/or service you are going to need to help avoid getting into any debt. Now that you have your budget in place, you need to find some nifty ideas on how to save money to start being able to afford the project of building your forever home. One idea is to set yourself a weekly living budget so that you can put aside something each week to go towards getting your project off of its feet. If you do lots of online banking, the one idea is to set up a direct debit to another savings account which will automatically put away a percentage of your income every month. This is a good solution if you struggle with putting money by self-motivation as the direct debit means you don’t have to think about it, you just have to get through the month minus the money put into savings. The final thing you need to consider with this project is that even the most astute saver will not be able to put away enough to build a whole house from scratch. With this in mind, you need to look into personal loans, such as those offered by Borrowell, to help see you through the project while also still keeping you and your family afloat. Once the money you need for the project has nearly been sorted out, you get to move on to the more fun aspect of your project-actually designing your home. You will already have an idea of the type of home you want but make sure that you don’t let your perfect vision forget about the very real concern of sticking on budget. The first part of designing your home is getting the foundation and structure sorted out to accommodate for all the space you are going to need, while also thinking ahead about plans to have a family, home office, or an extension in the future. 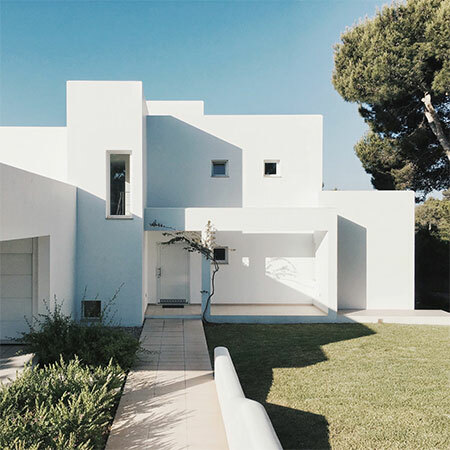 If you don’t have any first-hand architectural experience that you should begin with a step-by-step guide to designing a house to try and refine your vision before going in to talk it over with an experienced architect. Make sure to research reputable architectural firms with professionals who can help you to realize your vision and transfer it into concrete plans. Once you have done this, you can use your contacts from the firm to find hard-working builders who can take the plans and turn them into your dream home. Of course, building your home is only the first step, although the biggest, to achieving your forever home, it will really begin to feel like yours when you get onto the interior design. To do this, a good place to start is to learn the rules of interior design so that you are able to achieve a coherent but original look throughout your whole home. The first thing to think about is getting a color scheme together. The basic formula for this is choosing one neutral color, one bold color, and one metallic or pattern to add some flair. An example of this would be cream, maroon red, and gold or paisley pattern. The second thing that can add real originality to your home is creative shelving. This is not only a way to make the most of the space you are able to afford but can also add visual interest for your forever home. A great idea is to have shelving installed around the highest part of your walls which gives you more storage without getting in the way.